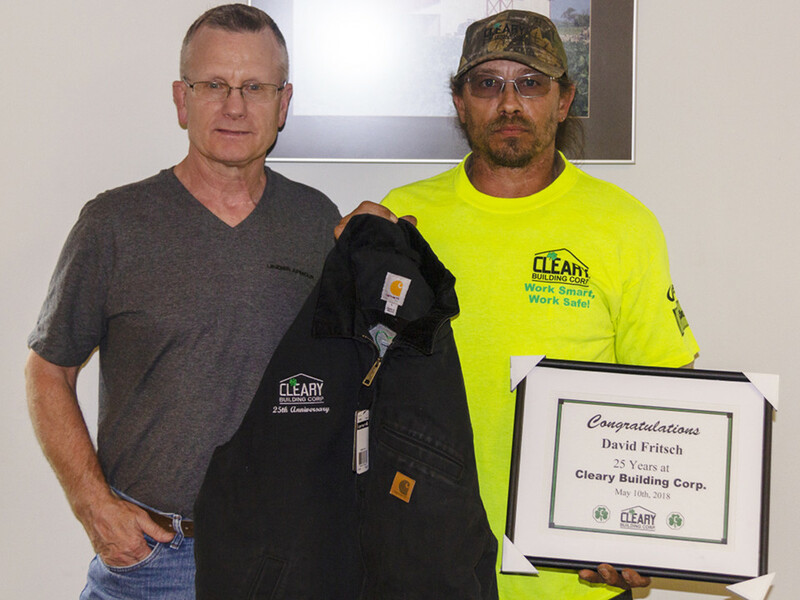 VERONA, WI – In appreciation for 25 years of service to Cleary Building Corp., David Fritsch, a Foreman out of Cleary’s office in Verona, WI, was recently recognized and presented with an anniversary certificate and a custom Cleary jacket. Over the course of his tenure at Cleary, David has made a valuable contribution to the growth and success of the company. Cleary Building Corp. would like to thank and congratulate David for his loyalty and dedication for the past 25 years. David lives in Belleville, WI. and a custom Cleary jacket. Area Construction Leader Hits Milestone: 97,000 Buildings Sold! Cleary Building Corp., the fastest growing company in their industry, proudly announces the sale of its 97,000th building! The building was sold by Sandwich, IL, Building Sales Specialist Patrick Murray. The building was sold to Phil Beaudry in New Lenox, IL. previous post: AREA CONSTRUCTION LEADER HITS MILESTONE: 109,000 BUILDINGS SOLD!